In 2013, thanks to the inaugural Rock & Metal Circus Festival, I was introduced to Schemata Theory, got the opportunity to have a chat with them and also reviewed their debut album 'Dry Lung Rhetoric' (2012). Considering many label them as a metalcore band, I was impressed with the album and their live performance, something about them stood out for me and I'm very pleased to say that new four track EP 'Words Not Heard, Read Or Seen' is a step up in quality again. Schemata Theory are a six piece band, based in Reading, UK and have two male vocalists in the shape of Luke Wright and Myles Dyer. 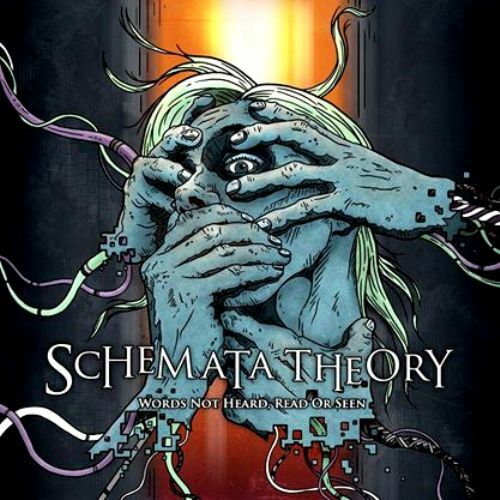 I'll say again, like I did in my previous review, that not everyone will like the vocal approach, which combines harsh and clean styles and is very 'modern metal' in sound, but if you can accept them, then Schemata Theory have an awful lot to offer. This EP still sounds huge but the songs feel a little more refined this time around. It's as if the touring and togetherness is really paying off in spades! Opener 'Beyond Our Shores' is a great way to start and reminds me a little bit like a male fronted Arch Enemy, especially thanks to the guitar work of Huw Roch and Mario Scinto who both excel in the riff and solo departments. I think it's this area where they stand out for me. The riffs catch fire and the solos are nigh on perfect and as clear as a bell. Of course that is not to discount either vocalist, or the bass work of Carl Quanstrom and drums of Joshua Barretto who work extremely well with the bottom end! Lead single 'Courage Is Contagious' is next and that is also a great track containing, melody, crunch, catchy chorus and once again a guitar solo to die for. 'Shadows Above All showcases the more melodic side of Schemata Theory but it is one of those slow building songs that by the end has you cranking your neck like there's no tomorrow. Last song 'Technocracy 'is a Modern Progressive Metal gem full of everything you could possibly want! So yet again, despite how some would genre tag them, Schemata Theory have delivered the goods and bettered their debut. My only complaint is that 'Words Not Heard, Read Or Seen, at four songs and 19 minutes, is just too short. I'm really looking forward to see how these new tracks come across in a live setting and you really should check them out! Oh, and I love the artwork as well!